The flourishing Sunny Bank Mills, the iconic Yorkshire mill complex between Leeds and Bradford, has won an honour in the Leeds Architecture Awards. 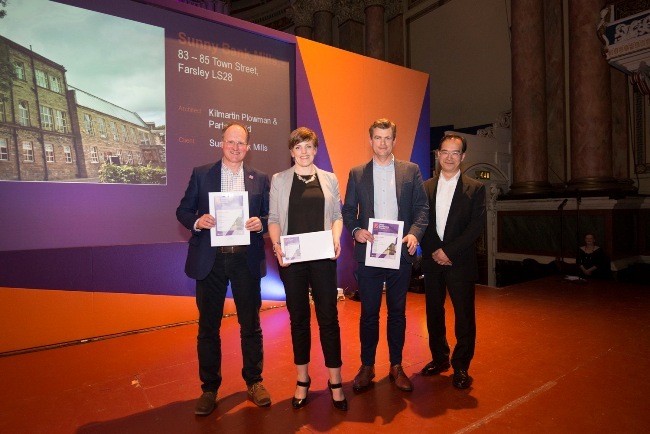 Sunny Bank, one of the most famous family-owned mills in Yorkshire, won the Regeneration category at a glittering ceremony at Leeds Town Hall. The award underlined the remarkable renaissance of the Farsley mill complex, where YTV’s Emmerdale and Heartbeat were filmed. During the past ten years Sunny Bank Mills, which has already won an array of awards, has been transformed into a modern office complex for the 21st century. It is now home to more than 70 companies, who employ a total of 355 staff. The ex-worsted mill has also become an inspirational creative space for business, placing the arts and industrial heritage at the heart of its regeneration programme. Alongside the ambition to become a centre for employment, Sunny Bank Mills has established itself as a cultural hub for the local and wider community through its arts and heritage programmes. William Gaunt, co-managing director of Edwin Woodhouse, the developers of the mill, said: “It was a privilege to be alongside so many development projects celebrating the energy and dynamism of Leeds and an honour to win this prestigious award. Presenting the award, Hiro Aso, the internationally-renowned architect, who masterminded the new-look King’s Cross Station on London and is now advising Leeds City Council on the advent of HS2 in the city, said: “Sunny Bank Mills has been family-owned since 1829 and is now working with the community to provide 600 jobs. Sunny Bank houses not just commercial tenants but also arts and crafts start-ups, providing support at the beginning. “The development makes sensitive use of the existing mill buildings. Longer term plans have an eye to the future, but with the community at its heart. Rachel Slater, director of Horsforth-based architects Kilmartin Plowman and Partners, who have worked very closely with the developers, said: “We are delighted that the hard work and dedication of the Sunny Bank Mills team, to deliver employment opportunities through the regeneration of the mill buildings over the last 10 years, has been recognised. The Leeds Architecture Awards are a celebration of excellence in architectural design. The awards aim to promote a sense of pride in the new developments that are reshaping the city of Leeds and making a major contribution to its future development and prosperity. They recognise and reward innovation, sustainability and the team work that is at the heart of successful development and regeneration. Leeds has an ambition to become the best city in the UK and the quality of its architecture and built environment has a crucial role to play in realising this ambition. “Great cities have great architecture but great places are ultimately about people and it is only by creating great places for people to live, work and visit that Leeds will truly become the best city in the UK.